Faster RAM is becoming more and more common these days and for good reason too. Gamers and content creators need more power and more speed from their systems and this is where faster RAM plays an important role. G.SKILL DDR 4 4333 MHz RAM has been announced and it is very impressive. This might not give a significant performance boost when it comes to gaming but faster RAM can help in rendering and other creative tasks that use heavy workload applications. Faster RAM makes the process smoother and quicker. G.SKILL International Enterprise Co., Ltd., the world’s leading manufacturer of extreme performance memory and gaming peripherals, is delighted to announce a new extreme speed memory kit running at DDR4-4333MHz at 16GB (8GBx2) capacity. And continuing with the pursuit of extreme memory speeds on the latest hardware, G.SKILL has reached an extreme DDR4-4500MHz speed on the Intel Z270 platform, achieving a stunning bandwidth write speed of 65GB per second in dual channel mode. G.SKILL is known for quality memory and we know about the recently launched RGB TridentZ DIMMS that have now become very popular with people that feel that aesthetic is as important as performance. Everything else was going the RGB route so why not RAM? The latest addition to the Trident Z series of extreme performance memory kit is the DDR4-4333MHz CL19-19-19-39 timing in 16GB (8GBx2) at 1.40V. This is the first DDR4-4333MHz memory kit on the market in the 8GBx2 configuration for a total of 16GB. 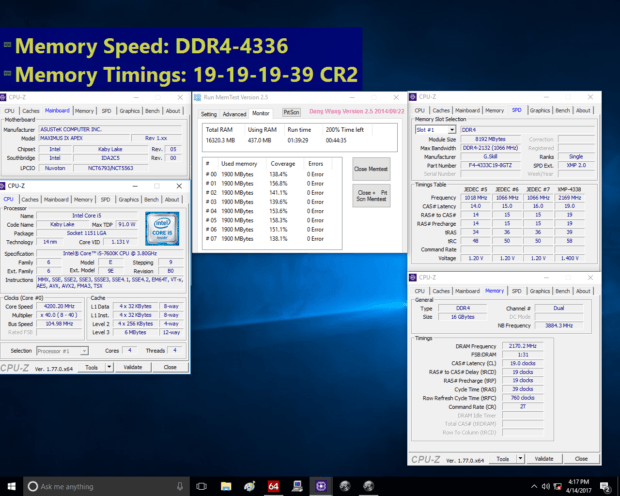 We have included the performance benchmarks of the G.SKILL DDR 44333 MHz RAM so that you can see the numbers yourself. As of right now, we do not know how much this memory will cost or when it will be hitting the market. Be sure to tune in for more details.